In 1680 in the forests of central and southern Ghana, the high priest to King Osei Tutu I called down a golden stool from the heavens and gave Tutu the divine foundation on which he would build the mighty Ashanti Empire. The Ashanti combined strength in war  conquering lands from what is now Ivory Coast in the west to Togo in the east and defeating British colonizers several times  with skill in art, particularly sculpture and cloth. But not everyone appreciated their authoritarian ways, and in the early 1700s a group of chiefs broke away and moved northeast. Traveling through a narrow pass in a line of towering granite cliffs west of the Volta River, they came to a plateau whose woods offered good hunting. The village became known as Kwahu-Tafo; its name combines the words in Twi, Ghana's main language, for "go and die"  the fate of many an Ashanti warrior who tried to scale the cliffs under a hail of rocks from the separatists above  and "wet ladle," or plentiful food. 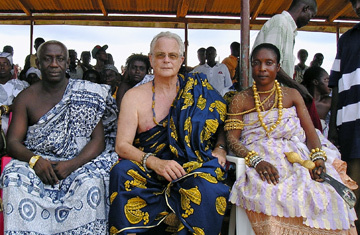 Ten years ago, my uncle, Humphrey Barclay, became a chief of Kwahu-Tafo. Humph has noble lineage of his own: a clan cloth  the Barclay tartan  and ancestors stretching back through the founders of Barclays Bank and the first Quakers to the time of William the Conqueror. But it was as a 60-year-old London TV producer that, in 2000, he traveled to Kwahu-Tafo for the funeral of Gyearbuor Asante, a Ghanaian friend and an actor in one of his shows. Something about Humph's manner impressed the chief, Nana Ameyaw Gyensiama III, a.k.a. Nana Tafohene, and after the burial he asked my uncle to mediate between a woman and her mother who had not spoken for five years. Humph succeeded  "I worked in TV," he says, "so I'm fluent in platitude." Almost before Humph knew it, the chief had adopted him as a son, renamed him Nana Kwadwo Ameyaw Gyearbuor Yiadom (Chief Monday-Born Hero Invincible Redeemer) and anointed him Kwahu-Tafo's head of development. A two-day enstoolment, or coronation, followed a year later; by then Humph had started work on a house in Kwahu-Tafo and formed a charity, Friends of Tafo, to raise money to fix up the village schools, dredge its rivers, run health campaigns and build a library and an Internet café. A signal success has been the senior high school, once run-down with just four pupils, now a complex of buildings, including a science block, with 500 students. It's a great story  how my uncle became a chief of a tribe in a faraway land. But it is not unique. Raphael Aidoo, who is writing a thesis on Ghana's foreign chiefs for his anthropology Ph.D. at King's College, University of London, has found at least 30: British, American, Japanese, Canadian, Australian, Norwegian and Jamaican. While my uncle is no exception, Ghana certainly is. Prosperous, democratic and peaceful, it is an island of stability in the sea of insecurity and poverty that is West Africa. Moreover, Ghana's chiefs display a pragmatic adaptability rare among monarchs. It's something they likely owe to the Ashanti, who were never truly conquered by the British but who, curious about what gifts their prospective masters might bring, consented to a nominal colonialism. The same sensible expediency endures today. "It's not about being black or white," says chief Nana Tafohene. "It's about the best way to progress." It's also about solving some key problems with aid. Donors tend to think of foreign aid as charity, and unequivocally a good thing. Often overlooked is that, for the recipient, charity can be disabling. Skills are lost, duties forgotten and dependency fostered. That is not the case with Ghana's foreign chiefs. "I am in charge," declares Nana Tafohene in his tin-roofed palace in the center of Kwahu-Tafo. "Fixing the schools was not your uncle's idea. He does the tasks the community asks him to." Such chieftaincy also provides a neat answer to another perennial aid flaw: What happens when the aid workers leave? "It's a lifetime job," says John Lawler from Newcastle in northern England, enstooled by the village of Shia in eastern Ghana when he taught there in the 1990s. So convinced is former U.N. Secretary-General Kofi Annan, a Ghanaian, by the lessons of Ghana's tribes, he proposes a council of foreign chiefs to spread the word. For Nana Tafohene, color blindness is less a matter of principle than common sense. It is by looking past black and white, he says, that he can see a rosy future. "I drew your uncle near to me and made him part of my family. He did not change my people  I changed him. And by bringing him in, I could monitor him, see how we were benefiting from him." Nana Tafohene grins: "So far, so good." This article originally appeared in the April 11, 2011 issue of TIME Europe.